chicken | Happiness is a warm oven. Posted on August 12, 2014 by Jenn C.
This is adapted from a recipe I found about a month ago, but never got around to making. The original recipe called for thawed and squeezed, frozen spinach. 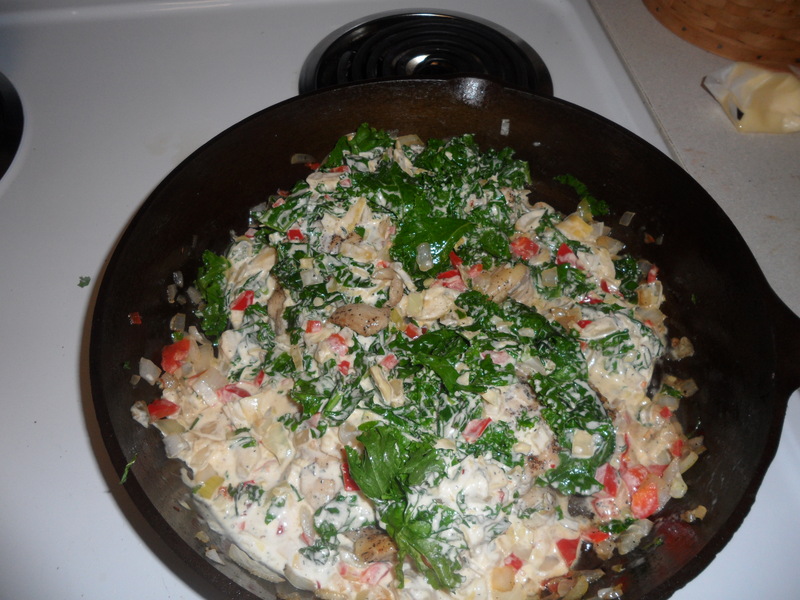 I thought using kale instead would give some texture to the final dish, as it doesn’t mush up like spinach does. I also added fresh herbs to my recipe and subbed in Japanese mayo, just because I had it around. As a side dish, I peeled an enormous sweet potato and cut it into rounds. I laid the rounds on a sheet pan, drizzled them in garlic olive oil, and gave them a pinch of minced rosemary, brown sugar, salt, and pepper. I baked them in the oven with the chicken dish and they finished at the same time. Perfect. Disclaimer. I did not measure my ingredients. Use your best judgement. Taste. Make enough sauce to coat the chicken and kale. Use equal parts mayo and yogurt. Make it your own! Salt and pepper chicken. Brown it on both sides. Don’t worry about cooking it through. 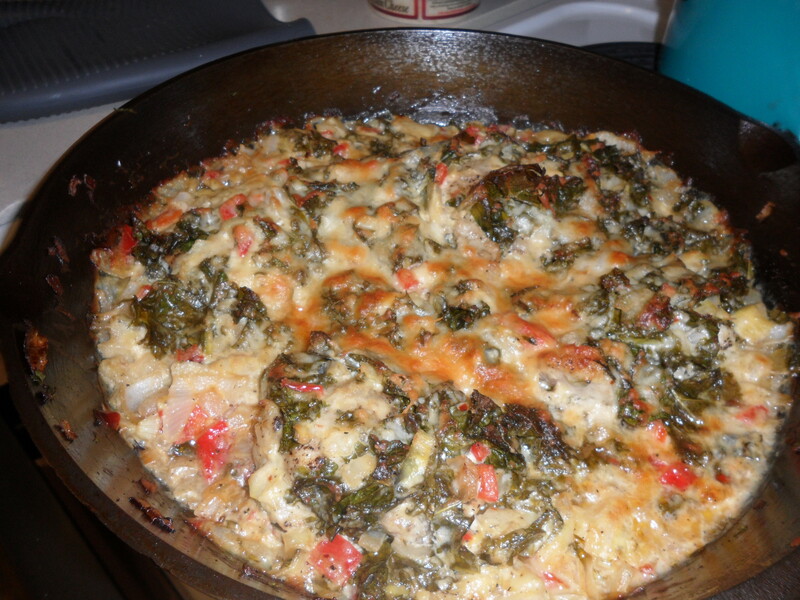 I did the entire dish in a cast iron frying pan, so it is a one pan dish–stove to oven. Mix artichoke, cheese, mayo, yogurt, herbs, and salt and pepper in a bowl. Set aside. After chicken is done, set aside on a plate. 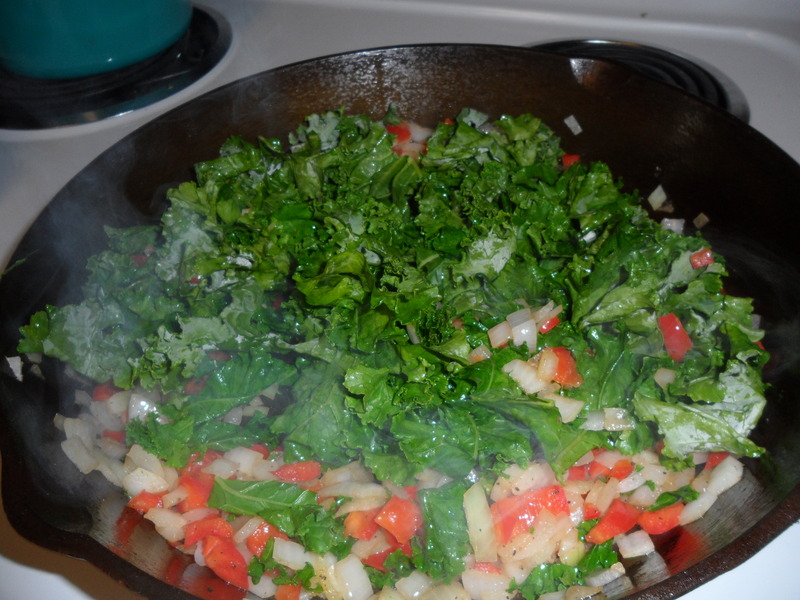 In the same pan, saute onions, peppers, garlic–then add kale and cook down. 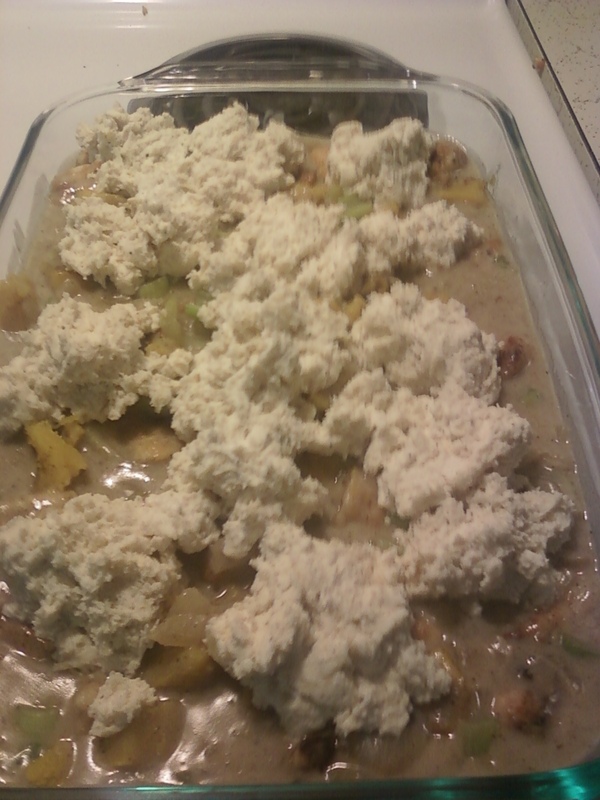 Turn off the heat, add the cheese mixture. Nestle chicken in the sauce. Bake until chicken is done and sauce is melty and gooey. Posted on October 5, 2013 by Jenn C.
It was a rough sort of week. It was a week of goals being met, tears being cried, frustrated, whispered arguments, and exhaustion. For every high we had, the lows arrived on schedule. Here we are, Saturday afternoon and we have survived. Henry has started college, got his driver’s license, and I got nominated for the Oregon Small Schools Teacher of the Year. It was a gorgeous afternoon. We went to the park this morning and have really enjoyed our day together. Now Henry is off to work, and the kids and I are settling into our evening. Since Henry started school, he reduced his hours at work and is only working weekend nights. I rushed to make a good dinner for us before he left, and I really threw it together. I made a huge mess in the kitchen and spilled flour all over the flour. But dinner turned out and it’s worthy of a blog post, so here it is. It’s really approximate, so use your own judgment if you choose make it. I floured the chicken chunks with flour seasoned with sage, salt, and pepper. I fried the pieces in batches, and then put them into the bottom of a casserole dish. In the meantime, I had the squash roasting and when it finished, I cut it out of its skin and diced it. 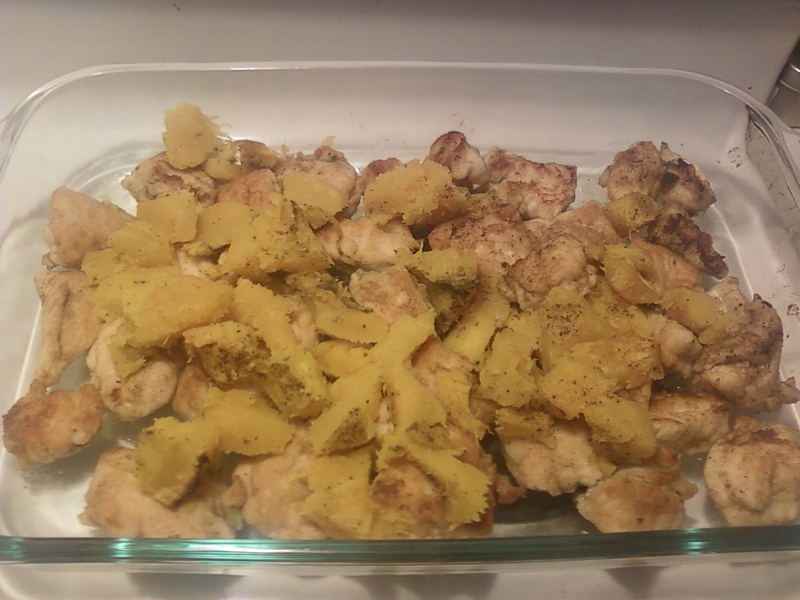 I layered the squash over the chicken. When the chicken was all done, I sauteed the onion, garlic, and celery in the same pan the chicken fried in. 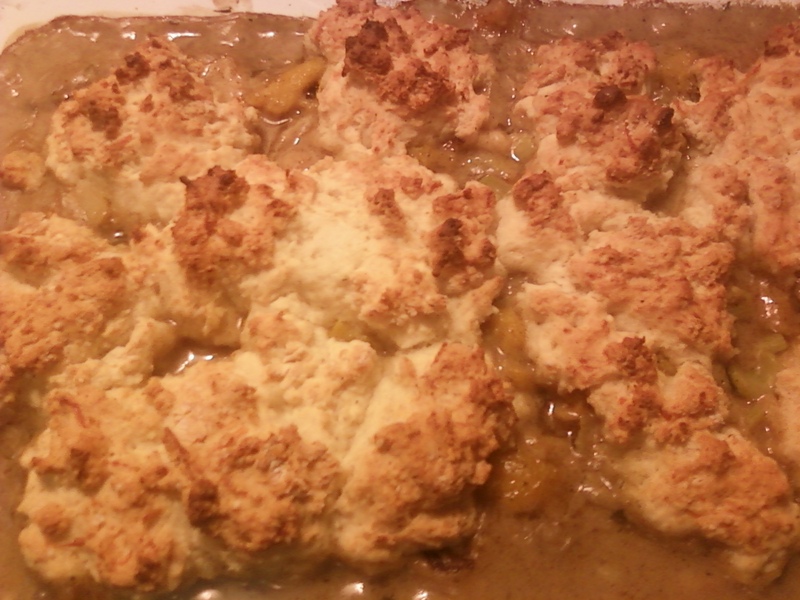 When the veggies were a little soft, I added a tablespoon of butter, some flour, and made a roux. Then I added stock and milk until I got the gravy to the right consistency. I seasoned to taste and poured the gravy over the chicken and squash. Then I measured out the baking mix, added buttermilk and parm, then dropped large spoonfuls of the biscuit batter over the chicken and gravy. Then I baked it in the oven at about 400 degrees for 30 minutes. It was was fast for a casserole dish, and super satisfying on a crisp, fall day. Posted on September 8, 2013 by Jenn C.
I got a lot done today. Kids up, fed french toast, clothed, and sent to church. Grocery shopping and battling every senior citizen in Eugene at Winco. Three homework assignments for my Master’s program. All of the laundry (with lots of help from Henry). 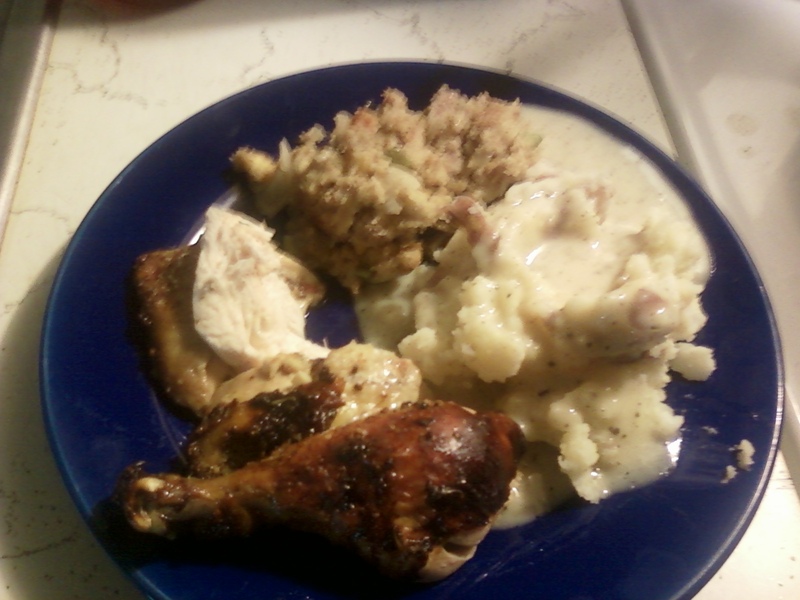 And a roast chicken, sausage cornbread stuffing, mashed potatoes, and gravy dinner. And I still have work to do before Breaking Bad. I think I have some journals to grade. 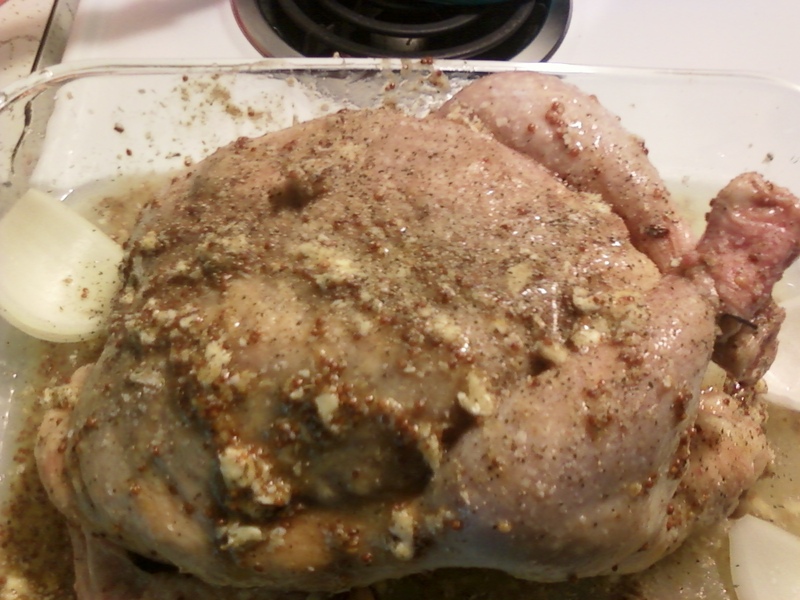 The chicken was roasted with a mixture of whole grain mustard, honey, garlic, butter, and salt and pepper slathered all over it. It was good–but next time, I’ll do something differently. Be careful to not burn the bird–that honey colors the skin FAST. Cornbread stuffing mix + onion + celery + fresh Italian sausage…it was perfect and homey. The potatoes were of the red variety. Mashed, simply. The gravy was thrown together without the pan drippings from the chicken. The mustard/honey was a little strong. Anyway. Whew. There’s nothing like a Sunday dinner. Posted on August 31, 2013 by Jenn C.
Suffice it to say, next week is going to be hellish. A full time teacher, grad student, half-time step mom, full-time struggler with anxiety…I am all of these things. What keeps me sane is a schedule, a plan, some cuddling, and laughter. School starts next week for me, for the 5 year old, Henry is trying to get his license and a car, and we are scrambling to just make a schedule and make it fair, effective, and efficient for everyone. Saturday night: Teriyaki chicken and potstickers. This is a throwback meal. Our one year anniversary is coming up on Wednesday, and this meal makes me remember our early dating. It may be the first thing he made for me. It’s nothing fancy. Just chicken + teriyaki sauce + potstickers from the freezer aisle. Dude food. 🙂 But it’s good and easy, and it’s a nod to where I was a year ago with Henry, so that’s why it’s for dinner tonight. Wish me luck, friends! Fellow teachers, good luck and let’s get it done! Posted on July 22, 2013 by Jenn C.
I am forever trying to find interesting, healthy, and kid-friendly recipes to cook. Having kids to feed has really tested my cooking abilities. I’ve been used to, in my adult life, to cook food for adventurous eaters. Then when I got with this little family, the biggest one would rather eat Spaghettios than mostly anything else. The little ones aren’t always the best eaters. Some days, they are adventurous. Some days, they just want scrambled eggs and nothing else. So, to adjust, we have Spaghettios in the cupboard and dozens of eggs in the fridge. I’ve got the usual recipes in my repertoire: meatloaf, scalloped potatoes, chili, spaghetti, pancakes and other breakfast things, pork chops, grilled fish, tacos, etc. Last night for dinner, we had lemon chicken kabobs and lemon parsley pasta. The chicken was my own recipe and the pasta came from Martha Stewart. The chicken was simple. I cut it up into kabob-sized pieces and marinated it in a fresh and bright marinade. The pasta was simple parsley, Parmesan, salt and pepper, lemon zest, garlic, and a bit of lemon juice. Easy and delicious. Here’s the recipe. I followed it exactly, except I halved it. The great thing about these dishes together is that the marinade would go well with any protein or vegetable, and I used angel hair pasta–but you could use orzo, cous cous, or even rice. In other news, we went to Turtles for brunch yesterday and it was amazing. I got chicken fried steak and it was absolutely perfect. Crisp and juicy with a well-seasoned gravy–and Henry had smoked salmon hash and he nearly licked the plate clean. I have to go out and find some good smoked salmon so I can recreate this dish at home. I think we could eat it every day. Posted on July 4, 2011 by Jenn C.
I have spent way too much time Googling chicken recipes this afternoon. An embarrassing amount of time. No 4th of July celebrating for me today, as I am hiding and lurking in the shadows, keeping my hair dyeing disaster to myself. I can’t get it fixed until tomorrow, so here I am, Googling chicken recipes. I found two recipes that caught my eye. The first one is from a favorite blogger, Closet Cooking. 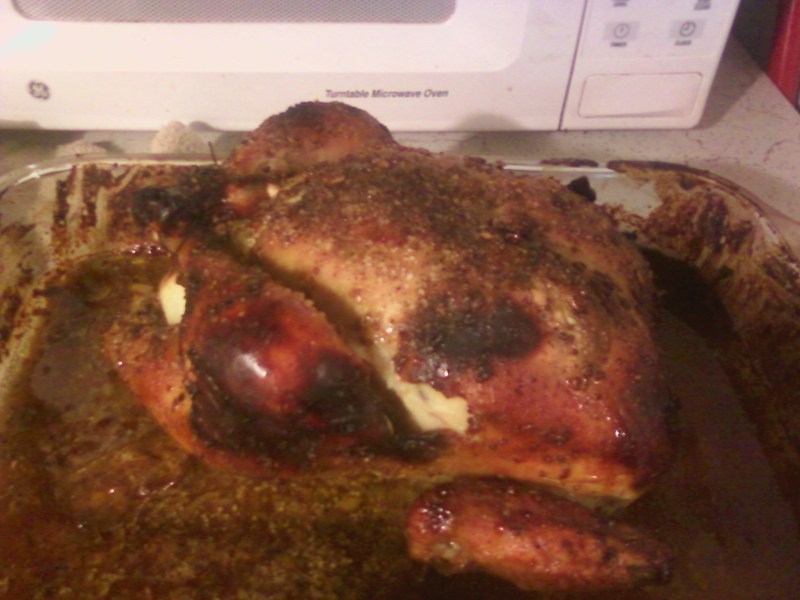 Here is his Curried Honey Dijon Roasted Chicken recipe. The next recipe that I want to try is from a new Food Network personality, Aarti Sequeira. Her show is called “Aarti’s Party.” Cringe-worthy name, huh? It’s like the only way Food Network could commit to an Indian food personality if is they could find some cutesy way to make her more mainstream. “Aarti’s Easy and Affordable Indian Meals” isn’t as charming as “Aarti’s Party,” I suppose. Anyway, I haven’t seen her show, but her food has good reviews and seems pretty delicious. Here is her recipe for Roasted Chicken Breasts with Orange, Cardamom, and Turmeric. My plan is to make both recipes and use them as lunches to take to work this week. 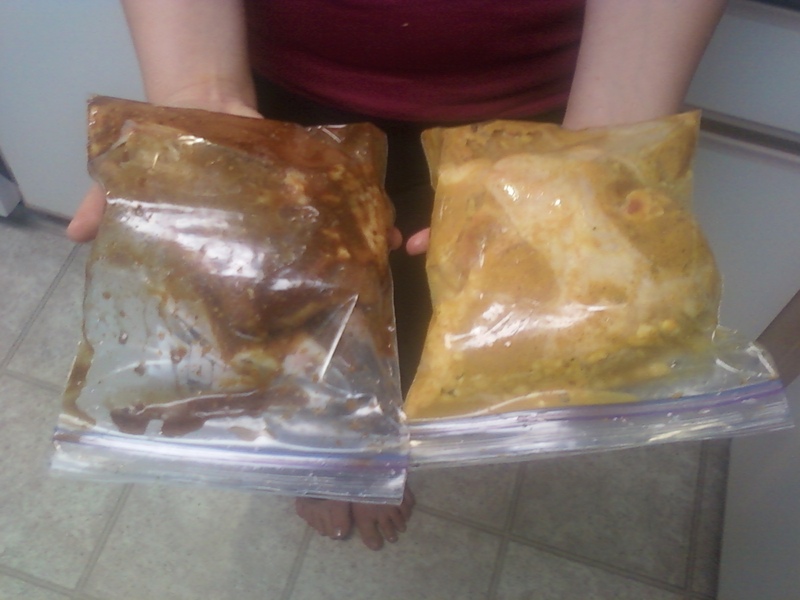 So, what I have done is mixed the separate marinades and have placed the chicken breasts in their respective zip lock baggies. They are resting peacefully in the fridge as I type this. Aarti’s recipe really doesn’t say to marinade the chicken, but instead, to mix the spices and juice with butter and to cover the chicken with the mixture and then roast soon thereafter . I’d like to cook all of my chicken at the same temperature and at the same time (in separate pans, of course), so I thought marinating Aarti’s chicken makes sense. It will give the chicken time to soak up the orange, cardamon, and turmeric and I guess I will just add the butter last minute, right before roasting. The Closet Cooking recipe is the baggie to the left; Aarti’s recipe is in my right hand. I roasted all of the chicken breasts at the same time in the oven. Silly me, I forgot to salt Aarti’s recipe. I salted it last minute, while cooking in the oven, and it turned out ok, but still, sheesh. Who forgets to salt a marinade?! Anyway, to accompany these recipes, I also made a rice pilaf with toasted almonds, cranberries, green onions, cumin, and ginger. I cooked a cup of rice in two cups of chicken stock, some grated ginger, and cumin seeds. After the rice was nearly done cooking, I chopped up three or so green onions, and added that to a huge handful of cranberries, and a handful of almonds I roasted in a small frying pan. When the rice was cooked, I added it to the nuts, fruit, and green onions. It was such a delicious pilaf and it went perfectly with both chicken recipes. We packed the chicken and rice for lunches this week and each recipe was a great success. I have been eating out way too much as a result. This. Needs. To. Change. Today. Camera or not, here is a blog post and camera or not I will be posting recipes and attempting pictures with my phone. Feta Rice Stuffed Tomatoes I will hollow out some tomatoes and stuff them with a feta rice dish that I made earlier this week. (Feta rice: 1 cup of rice, 1 cup of milk, 1 cup of stock, cumin, mexican oregano, garlic, a large handful of corn, 1 onion, some feta cheese. Saute the spices, garlic, and onion. Add the rice to the pan and toast it for a minute or so. Add the liquid, corn, and feta. Cover with a lid and cook until rice is tender.) After stuffing tomatoes, I will bake them in the oven at 400 degrees until they are bubbling and done. This week, for Jeff’s birthday, I bought a TV and an Xbox. He has been gleefully playing his games, and I have been watching Jamie Oliver’s old show, “Oliver’s Twist,” on Netflix. Let me just say this: I absolutely love Jamie Oliver. His food is accessible, passionate, playful–and Jamie seems to embody those characteristics as well. Super love him and super love his show. This recipe is from one of his episodes. It looked delicious. I don’t have a recipe for this, but I think I will throw in whatever sounds good at the moment. I have some artichoke hearts, sun-dried tomatoes, and mushrooms that sound like a lovely combination. I still don’t know what to do with the hamburger or chicken that I purchased, though. Maybe meatballs, and a chicken soup? I begin work again tomorrow (Summer School) and I need to start thinking about packing lunches again.